Each of the nine sea view private bungalows is equipped with TV, air conditioning, ceiling fan, mini bar and safe. Every bungalow has its own Japanese 'Onsen' (hot tub) on the veranda to warm up in at the end of the day. There are also two Panorama View Bungalows available at supplement. The Resort has an open air restaurant and bar, sea view fire pit area with comfortable chairs to relax in, a swimming pool and a fully equipped dive centre with a spacious camera room. There is also a lovely massage room complete with sea views. 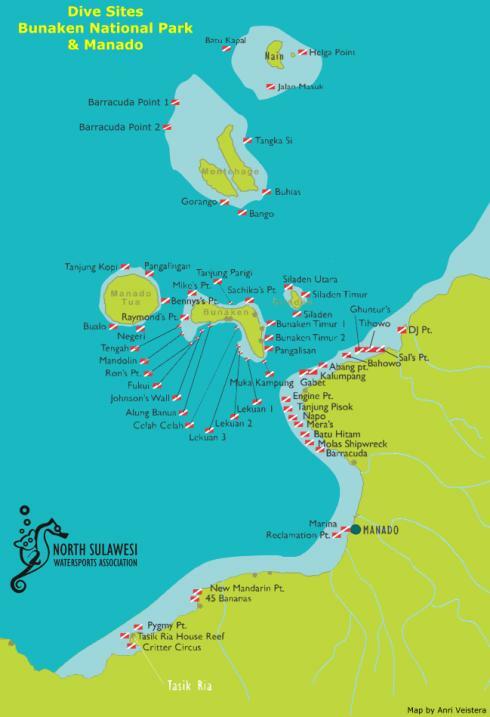 The Resort is located at the northern end of the strait out of sight of Bitung Harbor in the south, offering unspoiled views of Lembeh Island. Two of the most famous dive sites in Lembeh (called “hairball" and "aw shucks”) are nearby forming Dive into Lembeh Resort's house reef, with a choice of the black sand of “hairball", or a nice coral reef, suitable for snorkellers. The boat diving is done from newly built speedboats and the furthest dive site is only 12 minutes away. We are pleased to offer Twin Centre trips combining Dive into Lembeh Resort and Tasik Ria Resort, Manado. Packages including flights, accommodation, transfers and boat dives are available. Please ask a member of our team for further details. "We make a special mention about Dive Into Lembeh, which we can highly recommend. The transfers to/from the airport were spot on. Really lovely owners, well run dive shop, large and beautifully furnished rooms. We were also really lucky because for three nights we were the only guests so we had the run of the hotel. This meant we were the only divers with sometimes two Guides looking for stuff: they found us a Blue Ringed Octopus which made our day! If we ever go back to Lembeh we would stay here again without question." Came home on Thursday, booked a return trip on Sunday! "The Manado holiday was everything we expected and more! Transfers were very well organised. The driver was waiting outside the airport with a large sign with our name on it. Accommodation was first class and the food was excellent - my wife was particularly well catered for, she being a vegetarian. Dive centre staff and crew were supportive, enthusiastic and knowledgeable. The dive sites were mostly muck diving with several pristine reefs and walls. You go to Lembeh for muck diving which includes the trash and rubbish on the seabed. Memorable sights include Frog Fish, Mimic Octopus, Blue-ringed Octopus, Ghost Pipefish, innumerable Nudibranchs and the list goes on! There were so many memorable moments. Came home Thursday, booked with you to go back to Dive into Lembeh at the dive show on the following Sunday." Excellent Staff, Yummy Food and Fascinating Night Dive! "Twin Centre Manado Trip Staying at Dive into Lembeh and Tasik Ria. We really liked Dive into Lembeh - both the resort (small, great dive guides, yummy food and really well managed by Steve and Miranda) and the diving. We were a bit disappointed by the diving in Manado - this is about our personal preferences (like the critter stuff and the photography opportunities in Lembeh best) but Tasik Ria offered other nice features - really big swimming pool (we could actually swim in it!) and the Spa was lovely. Transfers and ground arrangements were all very easy and efficient. Accommodation at both resorts was as advertised - just loved the Dive into Lembeh resort - smaller, more personal and the set up just naturally facilitated us getting to know the other guests and enjoy diving with them. Dive centre staff were excellent in both locations. Dive sites/itinerary were great. The extra night dive we arranged locally in Lembeh was well worth the money - fascinating stuff comes out at night over there and our guide (Harry) was awesome! It was my favourite memory from the holiday. We've travelled with Regal several times before and no doubt will do so again." Dive into Lembeh was simply gorgeous. Beautiful and quiet location, good modern and stylish accommodation. Felt like a very professional and safe organisation with excellent guides. Particularly liked the fact that the managers dine with the guests every night to check that everything is OK. Saw far more in a week than I expected to. Highlight for me was seeing a wunderpus for the first time, and watching a coconut octopus running over the sand while juggling its shells. Occasional noise from the nearby public beach, but I think this was due to a major buddhist festival rather than party animals. Only downside I could see is that there really would be nothing at all for a non-diver partner to do here other than read and enjoy the peace and quiet. The diving at Tasik Ria and the resort were as good and welcoming as in previous trips. At the start of the fortnight I found diving in a 2.5 mm wetsuit perfectly adequate (29C water temperature). However, by the end of the fortnight and clocking up nearly 35 dives, I was starting to feel quite cold which is unusual for me. I'd recommend something a bit more substantial for this intensity of diving."